Learn how is it important to de-gas the water treated with cation bed and the procedure of de-gassing using forced draft method. In pharmaceutical industries, bore-well is the principal source of the raw water. Raw water is purified by water purification systems to use in pharmaceutical manufacturing. Cation and anion beds are used to remove the hardness of raw water. 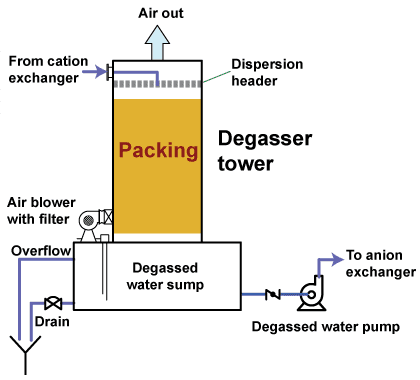 Degassers are used to remove the dissolved gases from the water. When water is passed through the cation exchange, carbonates and bicarbonate ions are converted into the carbon dioxide (CO2). Carbon dioxide is soluble in water, therefore; it is not removed from the treated water. This carbon dioxide increases the ionic load on the anion bed resulting in the more consumption of the sodium hydroxide. The efficiency of the anion resin is also affected due to this dissolved carbon dioxide. Degasser should always be installed after the cation bed. If water purification system contains the RO system then is it very important to remove the dissolved carbon dioxide because it can damage the membrane in a very short time period. Carbon dioxide is acidic in nature and interferes with the measurement of actual pH of water. Different methods are used for degassing of the water including thermal and membrane process but forced draft method of degassing is used in pharmaceutical water purification systems. In the process, water is passed through the column filled with the polypropylene having increased surface area. Air is passed through the polypropylene bed with the help of blower at the bottom of the column converting the water into droplets and dissolved gases are removed with this air from the top of the column. Carbon dioxide is highly soluble in purified water (1.5 g/l) and it can be reduced to 10 mg/l by this method.